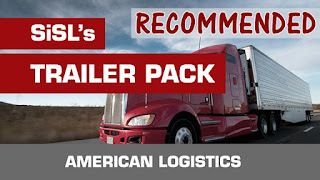 Adds over 100+ (currently) Top Grossing North American Logistics, Freight Company or Branded original trailer skins to your traffic with little to none performance loss. You can also use customized list of "always selectable" trailers of companies you like by simply selecting them. Each trailer carefully skinned by original photos, official company brand colors as you would see on the real roads, recreating them over vector format to bring you best and official wrap what you would really see on the roads. It is not just a pack of same model copied over by simple programs, it is officially interwoven with each other thus saving you performance. This pack is dedicated to real American truck traffic. Majorly 53 foot dry vans, reefers and doubles. Each company is cross referenced to trailer models they use. Also adds new trailer models 53 ft. Wabash, 20 ft, 40 ft and 53 ft. Container Carriers and Dry Van with Curtain kit . To make your game as realistic as possible with real company trailer replicas that are actively in traffic, not old companies, while bringing zero to none performance loss. Even for your own truck spotting within virtual world. 1. Go to: https://radiotrucker.com/sislsmegapack/trailers/wizard and select your game. 2. You will see large selection of companies and different for each trailer type. 4. Go in game, go to Freight Market, select a box trailer, go to company yard to get your job but press on Cog/Gear icon and select your picked up trailer. You can always use these trailers you like.